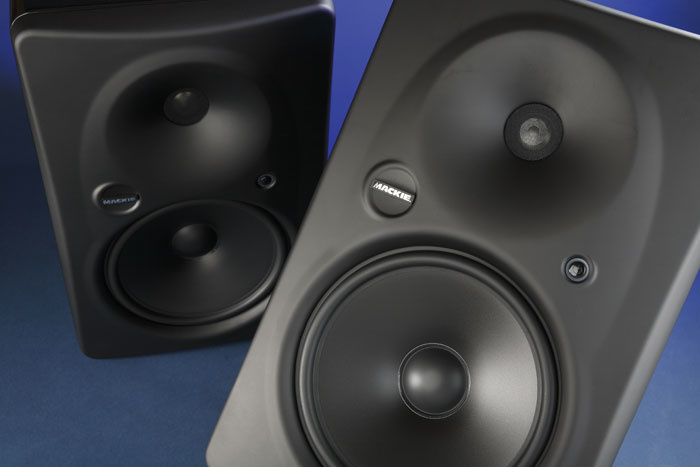 The HR-series monitors have been hugely popular, but Mackie have still managed to find room for improvement. 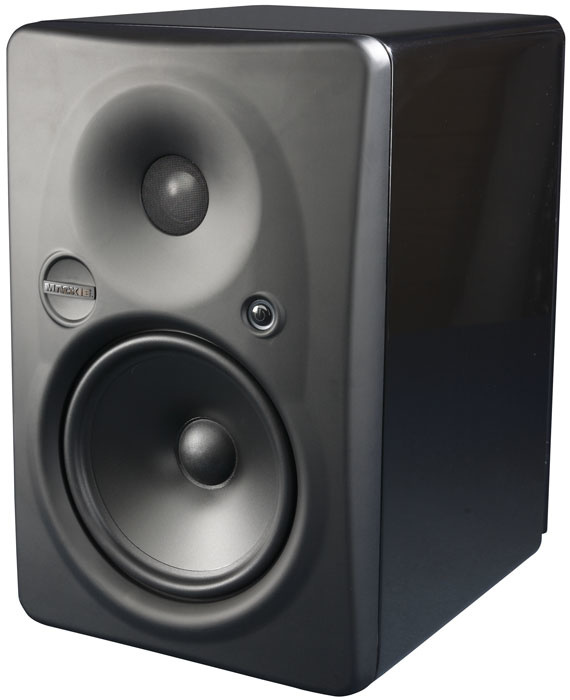 Mackie's HR series of active two-way studio monitors is one of the company's big success stories, as these speakers are in use everywhere from home studios to professional facilities. Now the company have finally launched a pair of successors, in the form of the HR824 Mk2 and the HR624 Mk2. The names may not show a lot of imagination, but one look at the new speakers shows that a lot has changed on the outside, and there have been a few changes on the inside too. Apparently EAW's design team, best known for their high-end live sound systems, had more than a passing hand in the redesign (like Mackie, they are part of the Loud Technologies group of companies). Manufacturing is carried out in the Far East, as it is for much of the Mackie product line these days. As both the HR824 Mk2 and HR624 Mk2 models are quite similar, other than in woofer size, power and frequency specifications, I decided to focus on the larger HR824 Mk2, but I've also discussed the HR624 Mk2 in a box elswhere in this article. The first thing I noticed is that, instead of the usual utilitarian black-ash veneer, the dense MDF cabinets have a new, shiny, gloss-black 'piano' finish. Also, though monitors of this type produce the widest sweet spot when standing upright, Mackie have made their logo rotatable, so anyone who insists on sideways mounting can at least have the logo the right way up! Another obvious change is the plain rectangular baffle, which has been replaced by a bespoke aluminium moulding with a curved front and radiused corners, but this isn't simply a cosmetic tweak — those rounded edges reduce diffraction, and the tweeter waveguide is moulded into the baffle so that the flare is completely smooth. A symmetrical driver layout means that there is no need for left- and right-handed models. At 425 x 273 x 351mm, the new cabinet is slightly larger than the original, but the convection-cooled amplifier design is essentially the same, though with some tweaks to match the new drivers. These FR (Fast Recovery) amplifiers use relatively low amounts of negative feedback, which improves their dynamic distortion performance, and also keeps the amplifiers stable if they are driven into clipping. A comprehensive set of controls on the rear of the HR Mk2 series monitors enable you to fine-tune the setup to suit your own working environment.Photo: Mike CameronInternal bracing is used to make the cabinet more rigid and, as with the older models, the free space is filled with an adiabatic (porous acoustic) foam to reduce internal reflections. Also carried over from the previous model is the concept of using a passive radiator (somewhat like a flat-fronted speaker with no drive coil) at the rear of the cabinet, in place of the usual tuning port. This acts much like a tuning port but has advantages at very low frequencies, where it helps prevent over-excursion of the woofer and also avoids port wind-noise. The radiator is quite large, measuring 12 x 6 inches, but it is hidden by the ventilated rear-panel assembly. During manufacture, the gain and frequency response of the speakers is individually adjusted to reduce performance variations due to component tolerances, so we should be able to expect better matching between pairs of speakers. An individual calibration plot also comes with each speaker, which is reassuring. The low-end performance is impressive, with the HR824 Mk2 covering 35Hz to 20kHz (+/-1.5dB). Electronic protection is built in, in order to reduce the risk of driver damage through over-enthusiastic use, and the drivers themselves are completely new. Handling the low-end and mid-range is an 8.75-inch woofer, which has a synthetic cone, a cast-magnesium chassis and a 1.6-inch voice coil. The high frequencies (HF) are handled by a one-inch, Ferrofluid-cooled, titanium-dome tweeter, in a polymer suspension. The original HR824 used an aluminium-domed tweeter, which I felt gave it a slightly sweeter sound than some of the rather brash-sounding titanium-tweeter models on the market at the time, so I've been looking forward to seeing if this new design sounds as smooth. Both drivers are magnetically shielded by means of flux-cancelling magnets. The tweeter waveguide is calculated to produce even dispersion of the two drivers, especially at the crossover point, which not only provides a wide sweet spot but should also reduce the colouring effect of room reflections. 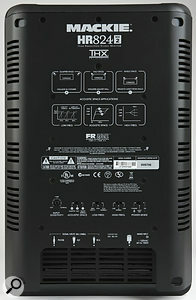 Both models are 'THX pm3' approved, and can be used in a THX surround system with the addition of a suitable subwoofer. 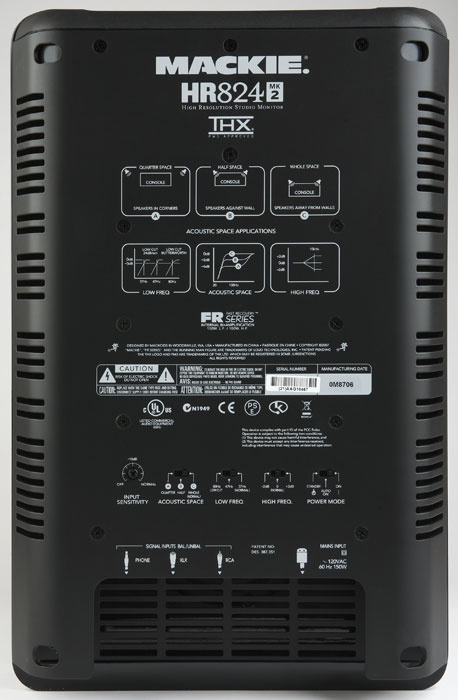 In the HR824 Mk2, the low frequency (LF) driver is powered by a 150W amplifier and the tweeter amplifier is rated at 100W, though both can produce over twice their rated power on brief peaks. The crossover is a modified Linkwitz-Riley filter, with a 24dB-per-octave slope and a crossover frequency of 1.9kHz. The peak SPL per pair at one metre is quoted as 120dB peak or 111dB short-term. Photo: Mike CameronThe original HR624s employ a six-inch bass driver (hence the '6' in the title) and, with the LF switch set in the centre 47Hz position, the bass response is roughly the same as that of the HR824s, which is plenty for most small—to-medium-sized project studios. Because the woofer is smaller than in the HR824, the mid-range handling is slightly better (in fact, I tend to use my HR624 Mk1s in preference to my HR824 Mk1s, as they are plenty loud enough and I like the extra mid-range definition), but the maximum SPL is slightly less. The Mk2 incarnation actually sound pretty similar but, like the HR824 Mk2, they are a little smoother at the high end. I'd say the upper-mid range was probably a bit cleaner, and the really high end a bit more pronounced, which results in a sound that is both smoother and more detailed at the same time. The maximum SPL is 5dB below that for the HR824 Mk2 and the frequency response drops off around 48Hz, but other than that the character is uncannily similar. Subjectively (once you have balanced their levels) only the depth of the bass extension of the HR824 Mk2 really sets it apart from its smaller sibling. Other than the power button, all the controls are on the rear panel, and they seem very similar to what was on offer for the original HR range. Once again, the input and power connections are tidily, but rather awkwardly, situated under an overhang at the bottom of the metal panel. There's a choice of RCA phono, balanced quarter-inch jack, or balanced XLR, though you can, of course, also connect an unbalanced jack or XLR. A rotary control sets the required input sensitivity, where normal is fully clockwise, and there is a three-way slide switch to select the mains power setting. In the Standby position, the circuitry remains powered up in a low-power mode and no sound is produced. When set to On, the speaker can be activated by the front-panel power button. In Auto On mode, the amplifiers turn off if no audio is detected for eight minutes, but they wake up pretty smartly if a level in excess of -45dB is detected at the input. The light ring around the power switch shows the amplifier status. A computer-style button on the front panel controls the power when the rear switch is in On or Auto On mode, and this is subtly illuminated — fortunately, it seems the age of eyeball-searing blue LEDs is coming to a close! The Acoustic Space switch sets the bass level to suit room position. 'Quarter' is best for speakers situated near corners, 'Half' is for speakers placed close to one wall, and 'Whole Space' is best suited to speakers positioned well away from any walls. Of course, mounting right in corners or up against a wall is not recommended. There's also a switch to set the low-end performance, which in the case of the HR824 Mk2 offers an LF roll-off at 80Hz, 47Hz or 37Hz. Where the room is too small or too poorly bass-trapped to work well at very low frequencies, the 47Hz setting is a good option, whereas the 80Hz setting provides a passable emulation of the bass response of a small domestic music system, which is useful when checking your mixes. The 80Hz setting is also used for THX setups, where the speakers are being used with a subwoofer. In order to allow the user to balance the high end to taste, a further switch offers flat, +2dB or -2dB with a filter frequency of 10kHz. As a studio monitor, I really like the original Mackie 824s. I had been a bit worried that Mackie might change everything just for the sake of marketing, but it seems those fears were unfounded. Despite the change in drivers and the switch to titanium for the tweeter dome material, the HR824 Mk2 manages to keep essentially the same family sound as its predecessor, and though some HF detail, such as ride cymbal hits, comes through a little more dynamically than before, the overall sound is still smooth and well-balanced, and it doesn't start to sound brash unless the mix itself is over-aggressive. So if you like the original Mackie monitors, you'll have no trouble adapting to these. But, as I've mentioned, it isn't a simple repackaging. On well-mixed material the overall sound is a touch smoother and seems less 'in-your-face'. The mid-range retains clarity and detail at least as well as before — and possibly a little better — while the smooth, deep bass always impresses, particularly for speakers of this size. I know that some users criticise the performance of Mackie monitors, but in my experience this usually comes down to room problems or placement issues. The fact that the passive radiator is at the rear means that mounting too close to walls is never a great idea, and because the bass extension is so impressive, corner-mounting is definitely to be avoided. Problems can also arise in rooms that are not acoustically suitable for the reproduction of very low frequencies, though you can use the LF switch to select the middle setting. In a typical project-studio room, that can work really well, and there's still plenty of low end. I also know that you may be able to find more accurate monitors if you're prepared to extend your budget. But what really matters is that I always seem to end up with well-balanced mixes when I use my Mackie monitors. I've had the original 824s and 624s for some years now, and though I have tried other monitors, I keep coming back to the Mackies, as they somehow just feel comfortable to work with. If you're considering purchasing HR824 Mk2 monitors, you may also want to audition models such as the Dynaudio BM15A, KRK VXT8, ADAM P11A and M-Audio EX66. If you're in the market for something like the HR624 Mk2, you can look to equivalent models in the ranges of the same manufacturers. Good tonal balance, with plenty of bass extension. Connectors are awkward to access once the speaker is in place. These updates on existing favourites have a slightly classier sound and much better cosmetics, yet they cost little more than their predecessors. HR824 £899; HR624 £649. Prices per pair including VAT.